There’s good reason why shopping is also called retail therapy. Browsing and buying is made easier with a friend, and our style consultants are both pals and advisors. Embark on a guided sartorial adventure with your stylist—try out brand new clothes and accessories from an array of premium brands and let your expert create looks tailor-made for your lifestyle. Let our consultants help you de-clutter and re-organise your closet . You will have closet suggestions that will work for you through the entire season and beyond.Analyse, Classify,Organise and Refresh. Get your personalised style guide from elanstreet . It's a ready reckoner that you can refer to anytime you need to go shopping . Let's make your wardrobe work for you . Its time to do away with the problem of having nothing to wear while your closet is overflowing .Have the ultimate styling capsule that would give your style a breathe of fresh air. Discover clothes and accessories that works for your bodytype,personality and lifestyle. Get tips to De - clutter and Organise your closet . Go with your stylist for a personal shopping trip to fill up the gap with items that are versatile and can transcend seasons. Putting together Your bridal trousseau is one of most enjoyable and at the same time stressful aspect of planning your wedding . Your trousseau needs is going to be your best friend in the initial months of your wedding to ensure you have the right outfit for every occasion.Our wedding stylists will put together a capsule of products which will help you make an impression every time and still be versatile enough to be used in multiple ways. Since You always had something else to do rather than concentrate on yourself, it’s time to give yourself a little TLC. 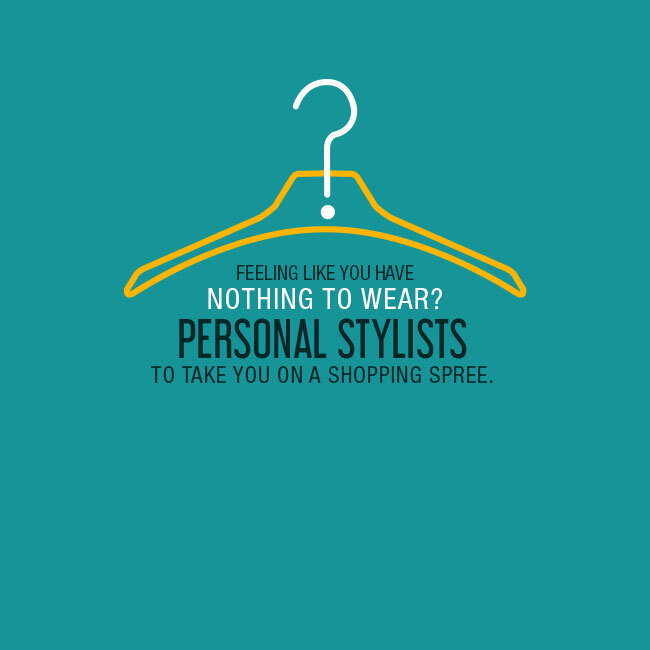 Let our stylists pamper you with a styling makeover experience. From spring-cleaning your wardrobe to sprucing it with the season’s brand new sartorial offerings, your stylist will give your personal style the refreshing edge you’ve been longing for. To put it simply, this package is a complete transformer. Bring out the best in you! Wondering how to dress at your best friend’s destination wedding? Or which outfit would make the cut at that conference where you’ve been invited to speak? From weekend getaway to business trips, your stylist will create bespoke looks for you to leave a lasting impression. To paraphrase Coco Chanel, dress shabbily and your outfit will be remembered—dress well and you will never be forgotten. Embark on a guided sartorial adventure with a senior style consultant—try out brand new clothes and accessories from an array of premium brands and let your expert help you build a versatile and functional wardrobe which transcends seasons. Let our consultants help you de-clutter and re-organise your closet . You will have closet suggestions that will work for you through the entire season and beyond.